Canada celebrated a milestone in CSA‘s robotics work on rovers. 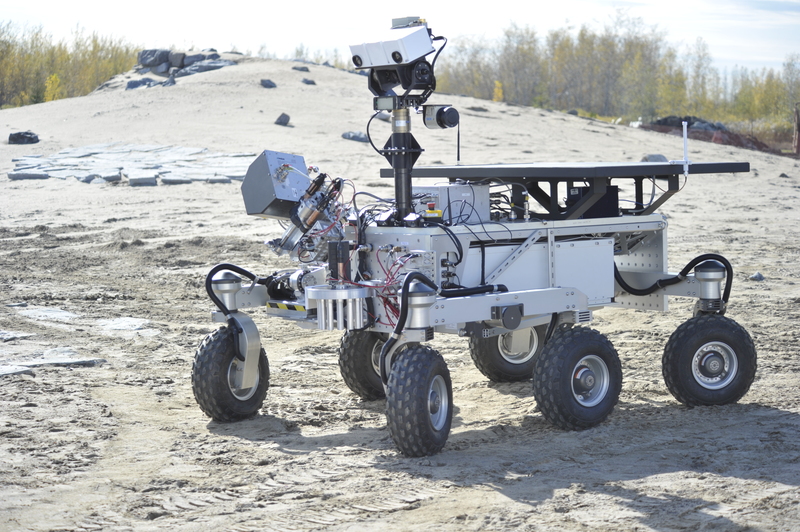 These terrestrial rovers are bringing the Canadian Space Agency (CSA) one step closer to developing the next generation of rovers for space exploration. The rovers performed robotic demonstrations at the CSA’s analogue testing terrain, the largest of its kind in the world, which replicates the surface of the Moon or Mars. The terrestrial rovers and scientific equipment unveiled are the forerunners of vehicles and science instruments that may one day serve in exploring destinations like the Moon or Mars. They will be put to work in field tests to: help define the science and technology most likely to be required in future space exploration missions of interest to Canada; assess potential contributions to such missions; and refine the required technologies so they are sufficiently mature when opportunities arise. This entry was posted in Rovers and tagged csa, rover by Thomas. Bookmark the permalink. This rover looks like Curiosity isn’t it ?